Click here to email the Netherwood Park Neighborhood Association. Let the NPNA Board and your neighbors know about issues, graffiti, crime, etc. 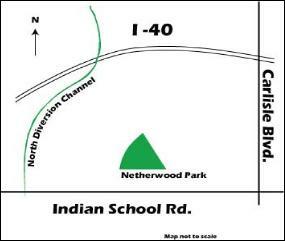 Netherwood Park Neighborhood is located in the center of Albuquerque, south of I40, north of Indian School Blvd, west of Carlisle Blvd and east of the North Diversion Channel. The neighborhood lies about a mile north of the UNM Health Sciences Center and UNM Law School. Click here for a PDF of our neighborhood boundaries.